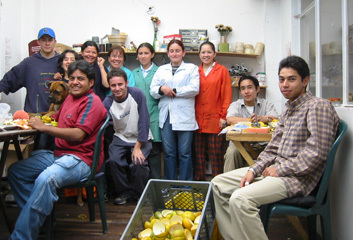 Piel Acida is an artisan based organization located in the urban city of Bogota, Colombia. 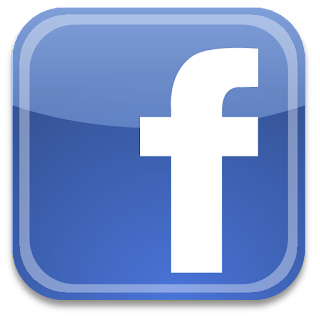 The organization was conceived in 1995 by Ana Piedrahita, an entrepreneur from Bogota. She was inspired by a handmade box from Uruguay made from dried orange peels. She experimented with the idea and was able to succeed in producing a wide array of unique and intriguing items from this very natural and sustainable material. Constant demand from the market and the potential of this innovative product lead to the formal registration of Piel Acida in 2000. Today Piel Acida works with artisan communities across Colombia, creating a wide range of contemporary and traditional crafts. Piel Acida employs more than 12 artisans who work in their factory and approximately 30 more artisans that work from their home permitting women to help support their families while caring for their children. While Piel Acida employs both men and women, the majority of workers are women providing needed income-generating opportunities for women in Colombia. The artisans at Piel Acida participate in the decisions that affect their livelihoods, such as wage determination for the products they create. This involvement is vital as each is paid depending upon the number of pieces they produce in a month. 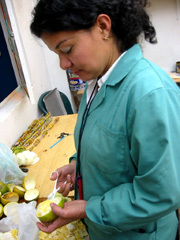 Piel Acida makes certain that the wages paid are fair and exceed the minimum wage laws for Colombia. The organization also provides other benefits to its artisans such as accident and health insurance, educational assistance for children, housing loans, and time for recreation. The sense of security artisans feel with Piel Acida contributes to an aura of unity with the organization as they lend their experience and skills to create sustainable and viable products, helping to position Piel Acida as a dominate force in the fair trade market. Apart from the artisans that Piel Acida directly employs, it also supports indirectly many others who are part of their supply chain for raw materials which include orange peels, tagua nuts, mazorca leaves, and wood. These natural materials are made into beautiful and innovative products by artisans at Piel Acida, as they seek to develop the artisan-based handicraft sector in Colombia. 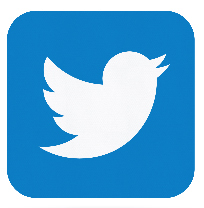 For a short video about the history of Piel Acida, please click here. Enhance your Christmas decorations with these handmade cornhusk angel ornaments from Colombia. Corn husks are sun dried for 2 to 3 days and then soaked in water for 10 minutes to make them soft and pliable. Then the damp husk is rolled, twisted, and tied to create the shape of an angel. 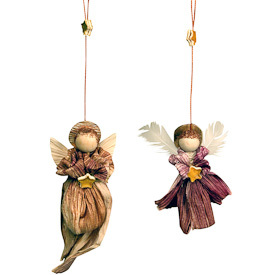 These wood and husk angels are also decorated with feathers and orange peel accessories to add a fragrant touch. These cornhusk angels are a tradition in Colombian culture and are made by artisans at Piel Acida, a craft producing organization started by Ms. Ana Piedrahita in 1995 in Bogota, Colombia. The organization has grown to support artisans all over the country creating traditional and contemporary craft products as well as providing insurance, educational assistance, loans and other services. Corn husk doll making is an ancient practice of the Native Americans, made with the leaf like outer coverings of the fruit. Corn is a very important crop which was domesticated by the indigenous people of Mesoamerica in the Pre-Columbian period. A sustainer of life, corn plays an important role amongst the Native American communities even today. Traditionally, these corn husk dolls are made without any facial features, following an ancient legend of the Iroquois people. The legend is about the three sisters - the corn, the bean and the squash and the creation of the “faceless doll”. The legend goes that once, the corn spirit was so happy to be one of the sustainers of life, that she decided to do something more for her people. So, the creator made a doll with corn husk and gave her a beautiful face, and sent her to befriend and accompany the people on land and to make them happy. One day the doll saw her reflection in a pool and became vain of her beauty. The creator warned her of her vanity, but she did not hear. The creator punished her by taking away her face. Even today these corn husk dolls are made without a face, a reminder to be humble and kind. Corn husk dolls are a popular way to utilize the remaining husk of the corn. The dry husks are cooked in water to make them soft and pliable. This also helps to maintain the shape of the husks. Then these husks are tied and braided together to create a doll other figurine and decorative items. The soft corn strands are used for hair. The corn husks are sometimes dyed to add color to the dolls. For a short video about the process of making these corn husk crafts, please click here.